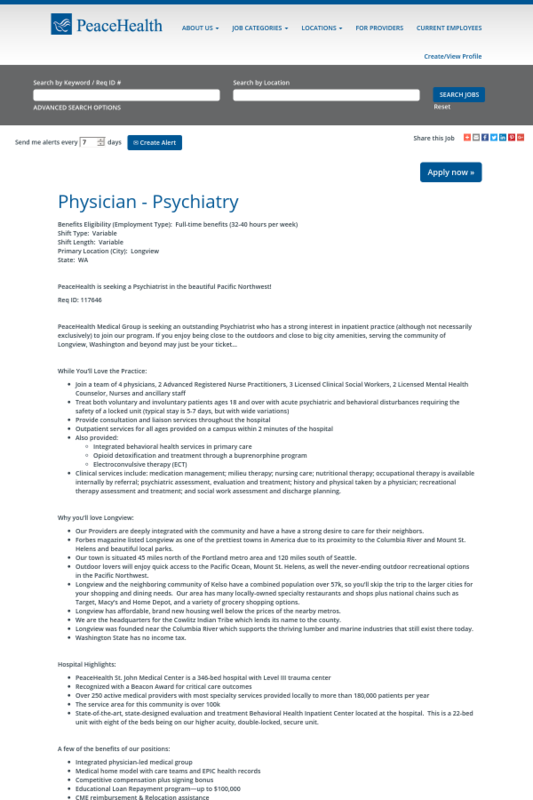 PeaceHealth is seeking a Psychiatrist in the beautiful Pacific Northwest! Clinical services include: medication management; milieu therapy; nursing care; nutritional therapy; occupational therapy is available internally by referral; psychiatric assessment, evaluation and treatment; history and physical taken by a physician; recreational therapy assessment and treatment; and social work assessment and discharge planning. State-of-the-art, state-designed evaluation and treatment Behavioral Health Inpatient Center located at the hospital. This is a 22-bed unit with eight of the beds being on our higher acuity, double-locked, secure unit.